New year, new recipes! Who else is looking to rid their favorite meals from added fat and calories? Not only am I in search of new meals for dinner, but I've also attempted meal prepping for the first time. 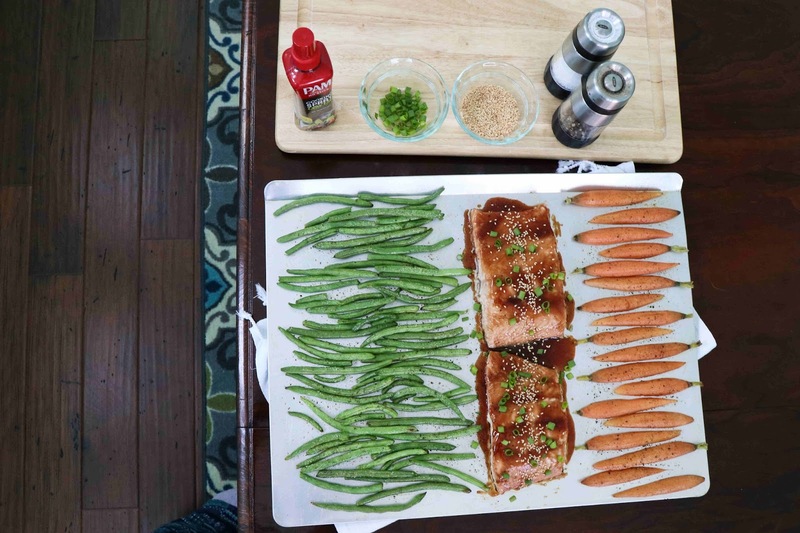 Sheet pan dinners are absolutely perfect for this. 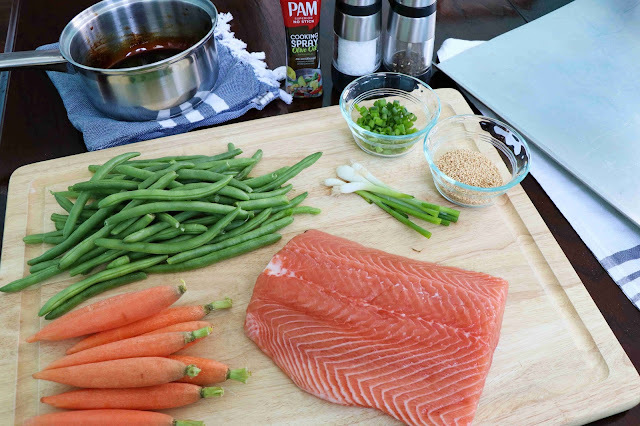 My goal is to bring my lunch to work four days each week, and one of my favorite one-pan meal ingredients is salmon. It's so easy to bake and cooks so quickly. 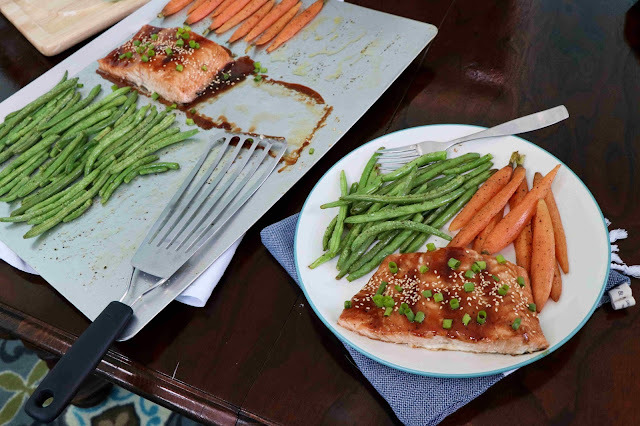 My little secret in the kitchen for creating these delicious sheet pan meals in minutes is NEW PAM® Spray Pump Olive Oil. It's the best for non-stick cooking and has no artificial colors, flavors, or preservatives. 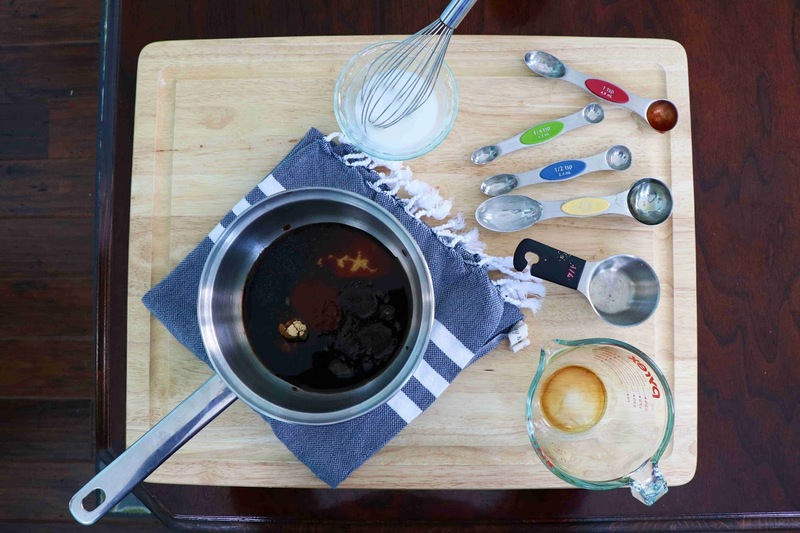 The first step in creating this delicious meal is the homemade teriyaki sauce. Like with the PAM® Spray Pump Olive Oil, I love knowing exactly what is going into my meal, and this sauce is so delicious! 1. Combine soy sauce, brown sugar, ginger, garlic, honey, and sriracha in a small pan. 2. Heat the ingredients over medium heat, whisking frequently, until the mixture starts to boil. 3. Combine cornstarch and water together in a separate small dish, and once the sauce is bubbling, whisk the cornstarch slurry into the sauce. 4. Continue to whisk for 2-3 more minutes, until the mixture begins to thicken. 5. Take the sauce off the heat, and allow to cool to room temperature. Once you have made the sauce, the rest of the recipe is so easy, and only requires a few ingredients. For these sheet pan dinners, you can really use any protein and vegetables you like - so versatile! 2. 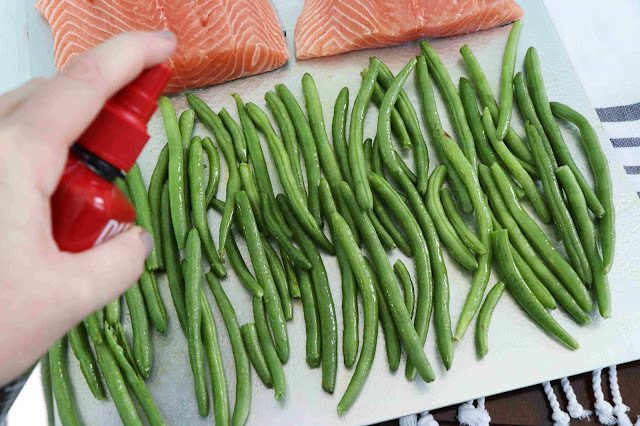 Spray a sheet pan with PAM® Spray Pump Olive Oil (about 5-6 pumps). 3. 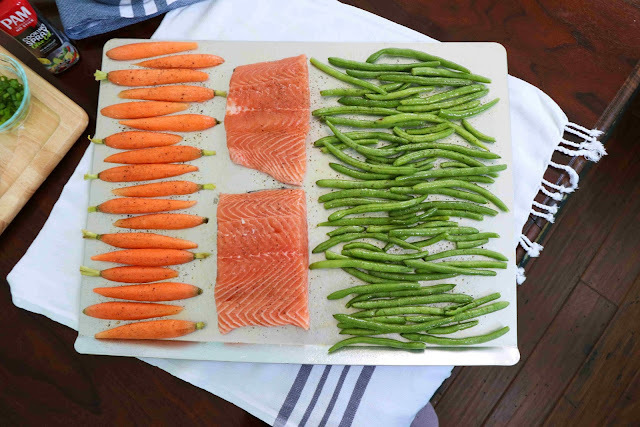 Arrange the salmon, green beans, and carrots on the tray. 4. 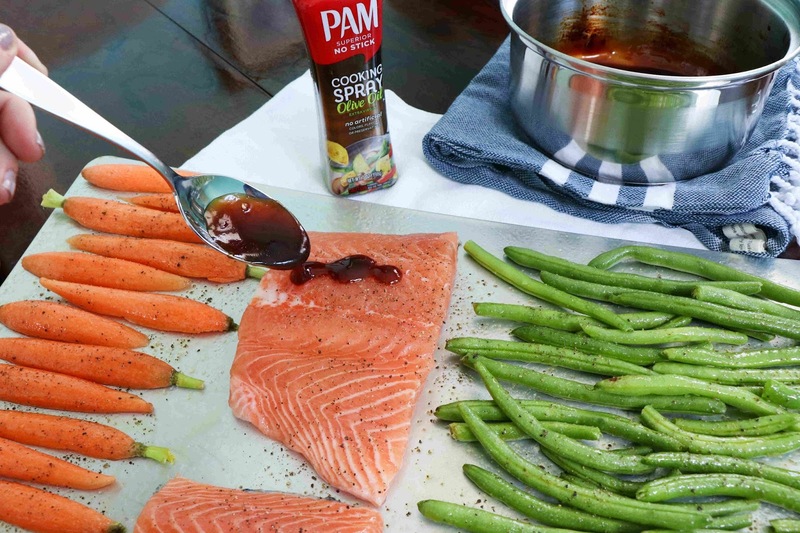 Spray the vegetables a few more times with the PAM® Spray Pump Olive Oil. 6. 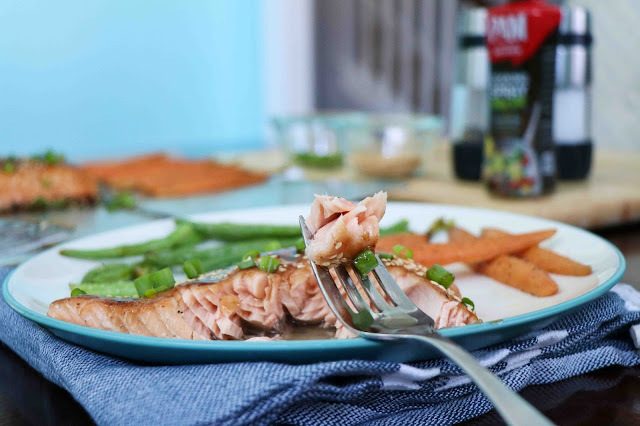 Spoon teriyaki sauce onto the salmon. 7. Bake the sheet pan dinner in the oven for 15 minutes. 8. Garnish the salmon with green onions and toasted sesame seeds. Seriously, how delicious does this look? 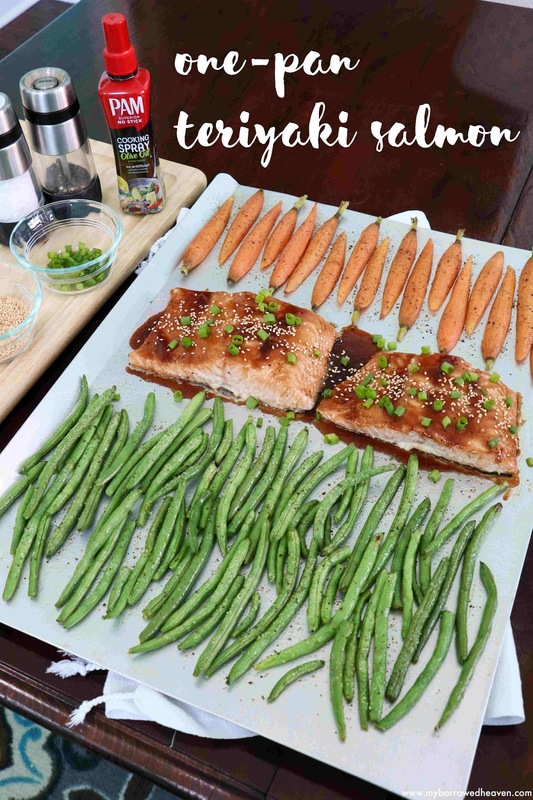 I love teriyaki salmon as a dinner right away or spread across 4 containers for a whole week of lunches. Looking to make your own delicious one-pan meal? 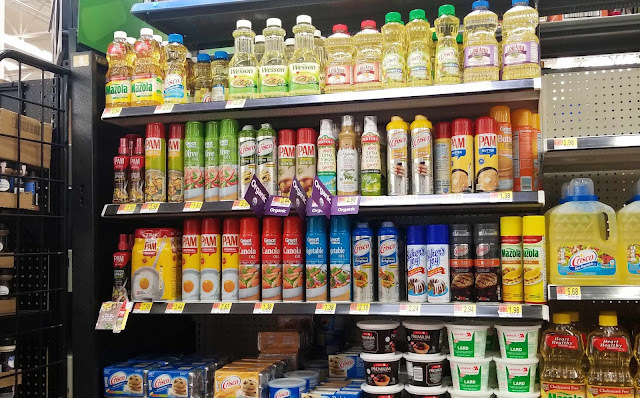 Earn $1 when you buy one (1) PAM Spray Pump Olive Oil or Canola Oil, while supplies last by clicking here. You can purchase all the ingredients above, including PAM Spray Pump Olive Oil at Walmart. Do you have a favorite one-pan dinner? I have a chicken/shrimp one sheet that we love. May need to try this too! I'm not a huge fan of salmon but this just might turn me into one! This is definitely my kind of mean- easy & healthy! 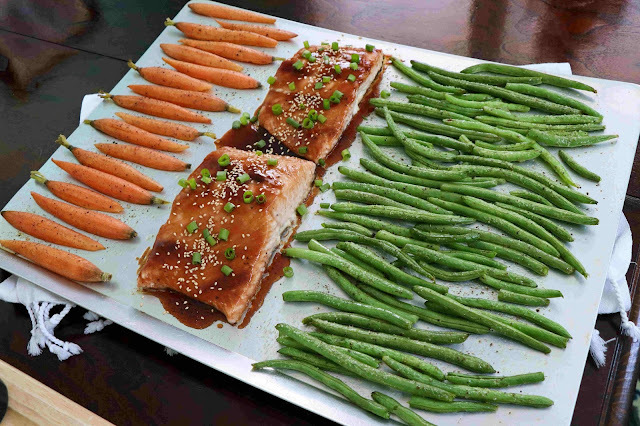 I love that the mess is minimized too with one pan only! YUM! Yum! What an easy weeknight dish!